Add New Jenkins Job . * Login to your wordpress admin panel . * From side bar choose Plugins >> Add New . * Press Upload Plugin , Choose plugin zip file included in your purchased plugin files. * Press install Now Button then Activate Plugin. * extract plugin zip file included in your purchased plugin files . * Upload extracted plugin files to wp-content/plugins directory . * From side bar choose Plugins >> Installed Plugins . 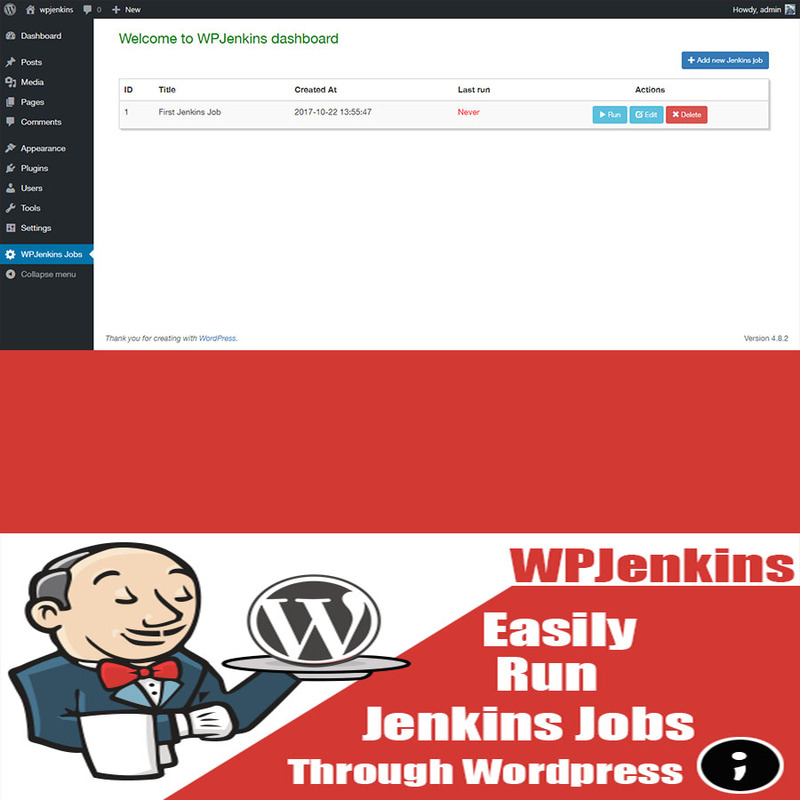 * Search for WPJenkins plugin then press Activate Plugin button . * Login to your jenkins url . * Click on the job you want to remotely execute through wordpress . * Click on configure link. * Scroll to Build Triggers section . * Mark on Trigger builds remotely (e.g., from scripts) checkBox . * Enter you Authentication Token . * Copy your job execution url ex: JENKINS_URL/job/first_job/build?token=TOKEN_NAME . * Replace JENKINS_URL with your jenkins host url and TOKEN_NAME with your entered Authentication Token. * The Url will be like that http://yourjenkinsurl.com/job/first_job/build?token=yourToken . 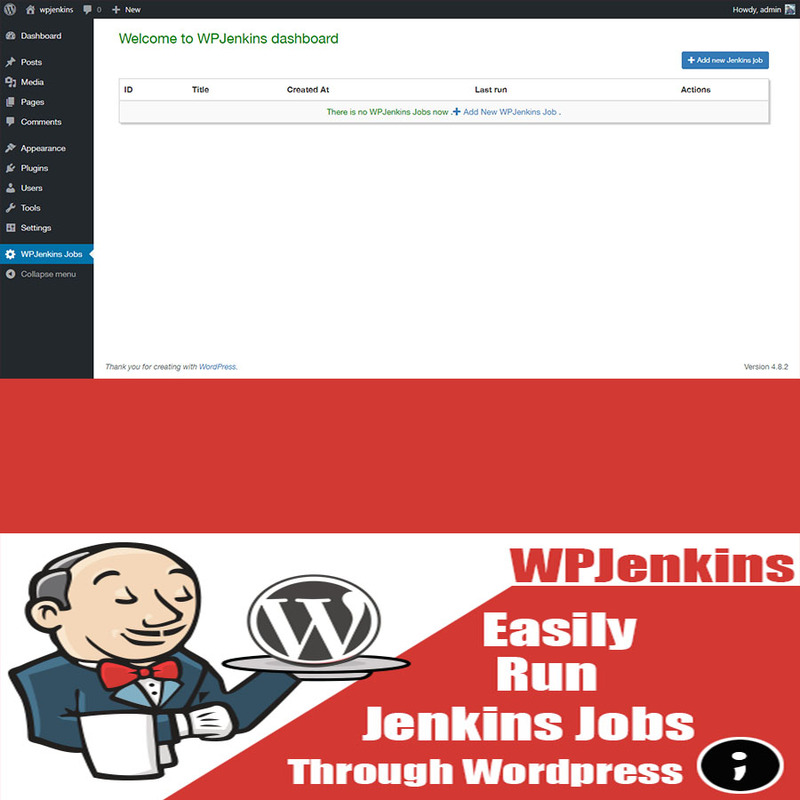 * From side bar choose WPJenkins Jobs . * CLick on Add new Jenkins job Button , A popup will appear letting you add your jenkins job . 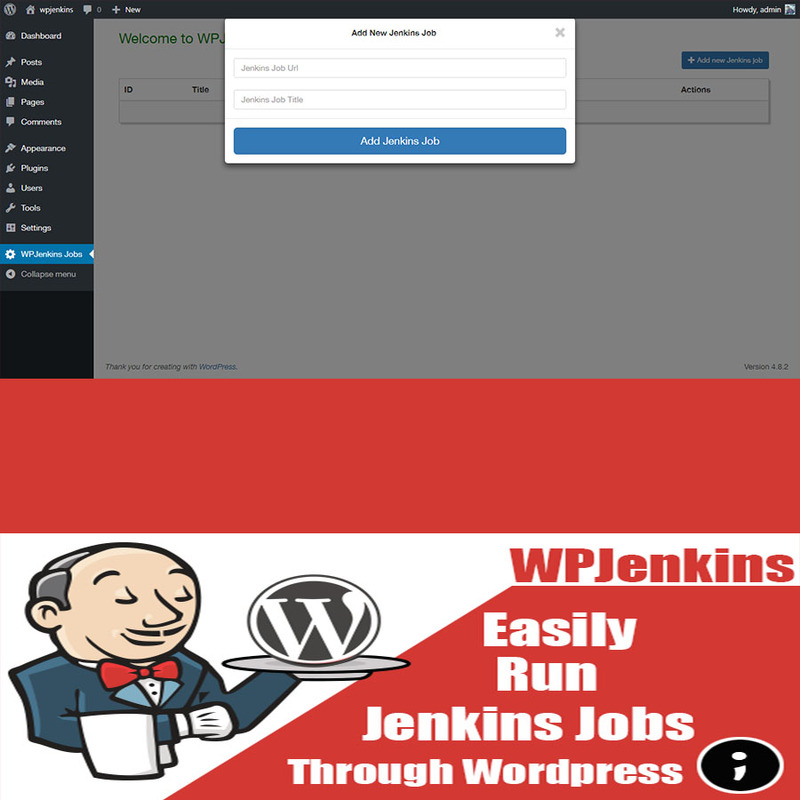 * Enter Jenkins Job Url . * Enter Jenkins Job Title . * Click Add Jenkins Job button . * A notification message will appear after adding your jenkins job , then the page will refresh . * Choose the Jenkins job you want to execute . * Click on run button . * A notification message will appear after running your jenkins job , then the page will refresh . * Choose the Jenkins job you want to edit . * Click on edit button , A popup will appear letting you edit your jenkins job . * Edit Jenkins Job Url . * Edit Jenkins Job Title . * Click Update Jenkins Job button . * A notification message will appear after updating your jenkins job , then the page will refresh . * Choose the Jenkins job you want to delete . * Click on delete button . * A notification message will appear after deleting your jenkins job , then the page will refresh . I’ve used the following Libraries as listed.